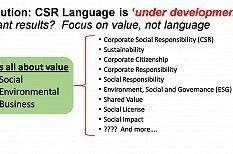 What is CSR? And why is it important to future business growth? Stop arguing CSR language. Who cares if CSR is this? Or that? Or something else. CSR is about value; creating, preserving and aligning value. CSR isn’t about a zero-sum trade-off. CSR is about what happens in the space where business meets community and environment where value is created most efficiently. Smart CSR (corporate social responsibility) focuses on value and builds strategy, tactics, plans and programs from there. The central theme is about aligning business value with social value and environmental stewardship; identifying synergies, alignments, tactics and more that will optimize value. Sometimes this might involve nearly pure philanthropic and charitable efforts and sometimes it may be about cutting business costs by streamlining and finding efficiencies within the supply chain while reducing environmental impact. Sometimes it may even be about building partnerships and collaboration. CSR can be any of these things, and more. But what it always comes down to is value. When I advise companies and organizations I tell them to think value, ask questions about value and make decisions based on value. What are the value propositions? What’s in it for your Business? For Society? For the Environment? Smart CSR asks these questions and looks for ways to become more efficient at creating and preserving value, and improving the relationship between cost and value. CSR is not about zero-sum. It isn’t about choosing society or environment over business, or business over society and environment. It is about choosing business, society AND the environment. When CSR is deployed effectively it gets more of all of these things instead of simply one at the expense of the others. This is no different than how other areas of business work. Business is very good at optimizing value creation around ranges of inputs. CSR is about bringing this same value optimization thinking and expanding the scope and dimension of value to deliberately include social and environmental. CSR Economics is about how you can be more efficient at creating and maintaining value in the space where business meets society and environment. CSR recognizes that business is under increasing expectation to create social value and be an effective steward of the environment at the same time as it creates business value. Smart CSR strategists and practitioners look inside and outside a business constantly searching for opportunities for alignment and synergy. Smart CSR looks for ways to expand and extend value propositions to efficiently align business value, social value and environmental stewardship. Smart CSR isn’t a cost for business. Smart CSR isn’t a cost of doing business. Smart CSR is an investment in business growth. It is a way of thinking and acting in a way that creates business value, and social and environmental value at the same time. 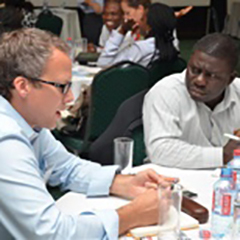 If you or your colleagues are interested in creating sustainable business growth opportunities based on value-based CSR implementations, I invite you to look at our CSR Masterclass Program in Jamaica later this month. Find out more or register here.